Chinese Fake factories have produced a lot of replicated gadgets, which are known as cheap and low quality imitates of well known brands. Products from Nokia and Blackberry are used for "inspiration" and sold with funny names like "Blockberry" and "Nckia". Of course the favourite brand is Apple and its iPhone. 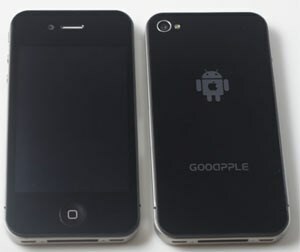 The latest product is called "GooApple", where the design of Apples iPhone 4 is mixed with Google Android software technology. This devices uses the iPhone 4 design in an exact way. For this reason original accessories can be used for the fake iPhone as well. The hardware components are different as well. For example insted of Apples A4 processor, the chinese phones uses a Qualcomm-Processor and instead of Micro-SIM card a normal sized SIM is used. Other specification are the same as for the original: WLAN, 3G, 3.5 inch touchscreen (but lower resolution) and a 5 megapixel camera. Android 2.2 Froyo is used as operating system. The creators of the device do not use the standard Andoid look and feel. Insead they have developed an interface, which looks the same as iOS. For brandnames and logos they are more cautious. On the back, where you will find the Apple logo, there is and Android robot with the Apple sign on its chest. This logo is also displayed during the boot process. The demonstration of the gadget can be seen in following video. Therefore it is proven that this gadget already exists and this is not a fake message. The Blogger of M.I.C. Gadget tested the devices and their fazit is: The GooApple is the best iPhone 4 clone yet. 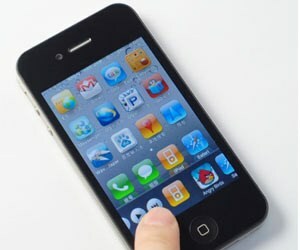 The iPhone 4 clone is available since June and costs about 184 Euros, which is not the cheapest of the chinese imitates but still a lot cheaper than the original. To get this phone you have to take a trip to the Chinese city Shenzen, which is close to Hongkong and a lot of Eelectronic companies are located there.